I love trail running. It combines my love of the outdoors, nature, observation, and running – all into one. Some of the most amazing and beautiful sights I’ve ever seen came on my own two feet while running. The potential of getting lost on the trail is a real risk of trail running. I’ve written before about how not to get (literally) lost on the trail: always carry a paper map (since phones and GPS can be unreliable on the trail), pay attention to your surroundings, frequently look behind you when running on an out-and-back trail (since the trail will likely look different going the other way). Today, something different – why you should get (metaphorically) lost on the trail. The Japanese have developed the concept of forest bathing – the medicine of simply being in the forest. Immersing yourself and your senses into the natural world to achieve all sorts of mental and physical benefits. Trail running can offer some of the same mental benefits, while still getting the physical benefits of the run. 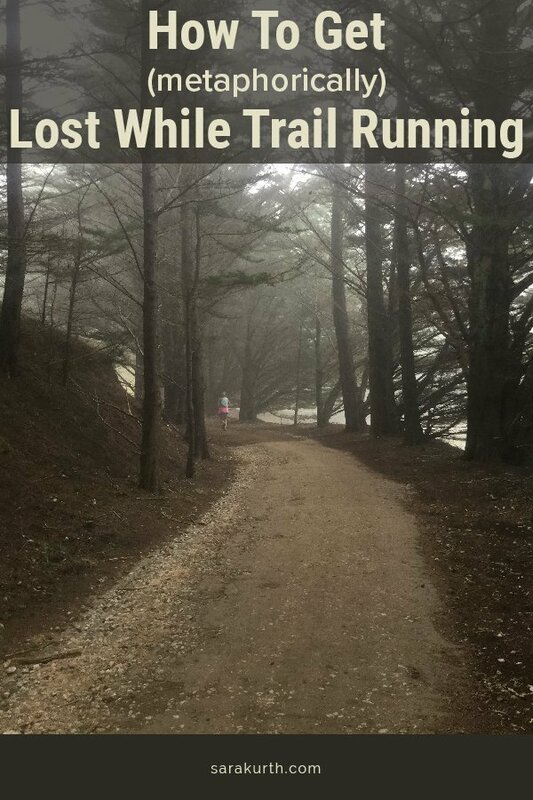 When getting metaphorically lost on the trail, the running workout takes a back seat. It is about you being out in nature – you just happen to experience it while on the run. 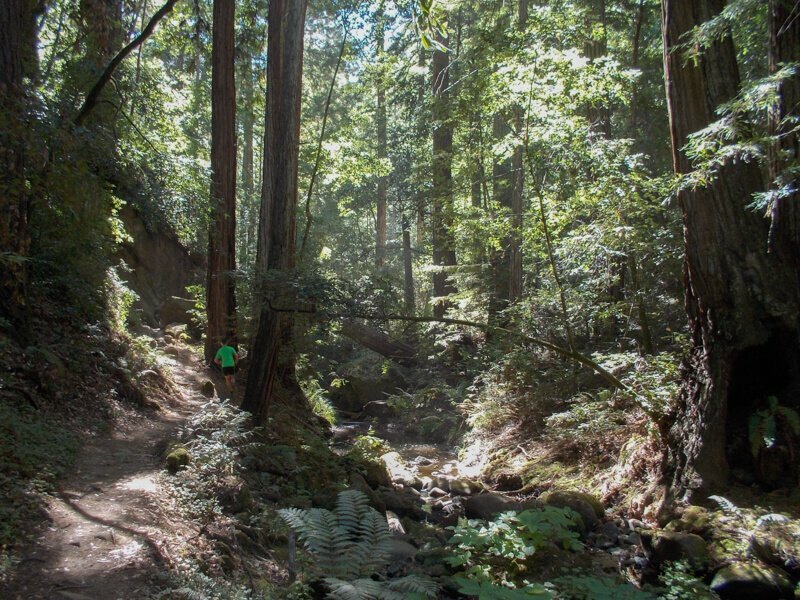 On most trail runs, your legs and your lungs get the workout. My most vivid experience with this lately was over the summer when I ran a trail race in Pacifica. When I got out of my car, the first thing I noticed was the smell – the combination of eucalyptus trees and the salty sea air was amazing. The first part of the run was in a dense fog, so I could feel the fog hitting my skin, and see the fog and clouds hanging in the trees. It was a physically exhausting run, but it was also mentally refreshing and exhilarating. Not literally (that’s a whole other ‘back to nature’ idea). Leave the headphones, music, podcasts, and GPS at home. Listen only to the sounds of nature and of the trail. If you use your phone or Garmin for navigation, go ahead and carry it, but once you hit ‘start navigation’ don’t look at it again. Getting (metaphorically) lost on the trail is most effective when you are out on the trail alone. There is a big asterisk to this, of course. It isn’t always safe to run alone on the trail. There is the potential to get (actually) lost or injured. So ONLY run alone on the trail if your safety and your navigational ability allows. If you will be alone on the trail, make sure that someone knows where you are going and when you should be expected back. That way they can sound the alarm if you don’t return. This is not the place for a crazy tempo/speed run. Run at a comfortable pace. Walk as often as you need to, for as long as you need to. What do you hear? Listen to your feet (especially if there are crunchy leaves) and your breath. Listen to the birds in the trees and the rustling in the bushes. What do you see? How is the light? What trees and critters are around? Safety note: still pay attention for potentially dangerous critters! What do you smell? The trees? Rain? Sun-baked earth? What do you taste? Not literally (unless you really know your edible plants), but on some runs, you can taste the air – I know I could in Pacifica when the air was thick with fog and eucalyptus. What do you feel? The water in the stream? Your feet on the ground? Safety note: don’t touch the poison oak! Go out for a trail run and get (metaphorically) lost and get in touch with nature. What about you? Have you ever gotten lost (literally or metaphorically) on the trail?